Should You Protest Your Property Tax Appraisal? 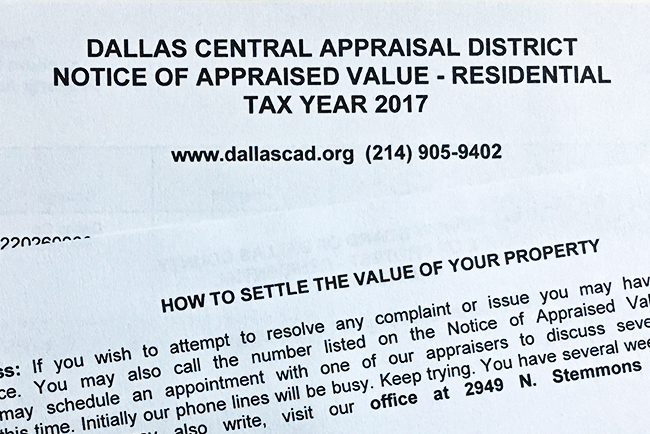 Many of you have received a letter from the Dallas Central Appraisal District (DCAD) stating the new appraised value of properties you own in Dallas county. If the value of your property did not increase, you most likely did not receive a letter; however, you can still protest the value. The question is, should you? Statistics show that if you fight the value of your property on a yearly basis, your savings can be substantial. Additionally, there is no evidence that your DCAD appraised value effects your actual resale value when it comes time to sell. So the answer is a resounding YES! Keep in mind you must file a property tax protest prior to May 31st! To see the current appraised value of your property, go to http://www.dcad.org/SearchAddr.aspx and enter your address. You can file a protest by clicking one of the available protest links for your property (“Print/Mail Account Protest Form” or “uFile Online Protest”). After filing a protest, you will receive correspondence from DCAD giving you a hearing date. This hearing is a formal meeting with an appraiser and 3 members of the community where you state your case. However, using your hearing as a method for reducing your taxes is often not the best way to obtain the best results! The easiest route (and one we employ personally) is to hire a property tax consultant to help you reduce your appraised value. These guys know how to speak “appraisal” and can sometimes get results better than you expect. Depending on the property, tax consultants often only charge a portion of what they save you in taxes — so their services have no net out-of-pocket expense. If they are not successful in reducing your value, then you own them nothing. Very cool. If you need a tax consultant recommendation, please reach out to us at info@RhodesRealEstate.com. If you’re more of the DIY type, we recommend you go down to the DCAD building well before your hearing date and talk with an appraiser one-on-one. They take walk-ins, but the wait is often minimal. You’ll want to bring photos of your property showing the “ugly side” or where upgrades/repairs are needed. These meetings are typically very cordial, and the appraisers often give you a break in some capacity. The benefit of going down before your hearing is that this meeting is not binding. If you don’t like the results, you can still go to your hearing armed with the information the appraiser used against you. If you do like the results, then simply sign a document and you won’t have to go to your hearing. If you have questions or if there is any real estate need we can help with, please feel free to contact us directly at 214-526-6600 or info@RhodesRealEstate.com. Want to Protest Your Property Tax? Here’s how.